Tottenham came back from two goals down to win 3-2 after an extremely sloppy start at White Hart Lane. The contrast between Spurs and opponents Southampton was worryingly obvious in the first half. The Saints had a plan: press high up and exploit the hosts’ high line. It worked all too easily. It isn’t worth analysing the opening half hour from a Tottenham point of view. Tim Sherwood’s men hadn’t shown up. Southampton’s talented personnel took advantage of a Spurs side that has repeatedly failed to start matches positively this season. Rickie Lambert and Adam Lallana warranted the praise they’ve been receiving for months with some superb link-up play, especially for the second goal. Lambert’s footwork in setting up Lallana shouldn’t go unnoticed, despite Kyle Naughton’s second glaring error of the match. Naughton gave his best display in a Spurs shirt against Arsenal just over a week ago, but it is clear that he lacks the quality needed to play for a team challenging for a place in Europe’s elite competition. Kyle Walker’s progression has coincided with Naughton’s lack of development since they were both signed. The former’s error against Chelsea reminded fans of the old Walker; the player that was more than often punished for various concentration lapses. Now, he is a much better player. His return to fitness will be vital if the team has any chance of getting anything out of this season. Southampton cut through Spurs a number of times in the first half, even after Christian Eriksen halved the deficit moments after the visitor’s second goal. More on the Dane later. Back to Spurs’ back four: Naughton’s defensive compatriots didn’t fair much better than the right-back. Younes Kaboul and Jan Vertonghen were poor with the ball at their feet, and failed to cover for Naughton’s errors. Both, however, hugely upped their game in the second half. Danny Rose displayed a tendency to overrun the ball when dribbling throughout the match, but passed the ball reasonably well. Rose has attracted an odd mix of criticism and plaudits all year. The 23-year-old has struggled recently after a decent first half of the season. Another player that divides opinion is Moussa Dembele. The Belgian struggled against a Southampton team determined to allow Spurs’ midfield as little time on the ball as possible. He was substituted at half time for Gylfi Sigurdsson, who proved to be a key part of Tottenham’s turnaround. Sigurdsson, most likely under instruction, aided Spurs in mirroring Southampton’s midfield display from the first half. He pressured his opponents, attempting to close them down high up the pitch, and tracking back if they got past him. It was just what Spurs needed. Nabil Bentaleb’s contribution also aided the transition from defence to attack. He made more tackles than any other Tottenham player (5). Sigurdsson was eventually rewarded when he brilliantly struck Eriksen’s lay-off into the back of the net in stoppage time to win the game. Eriksen’s assist was the cherry on top of an inspirational all-round performance by Tottenham’s primary creative outlet. He had more touches than any other player on the pitch (82), the most shots (6; 4 on target; 2 goals), and created six goal scoring opportunities. Nathanial Clyne’s Naughton-esque error gifted Eriksen and Spurs a way back into the game. The Denmark international almost equalised before the break. 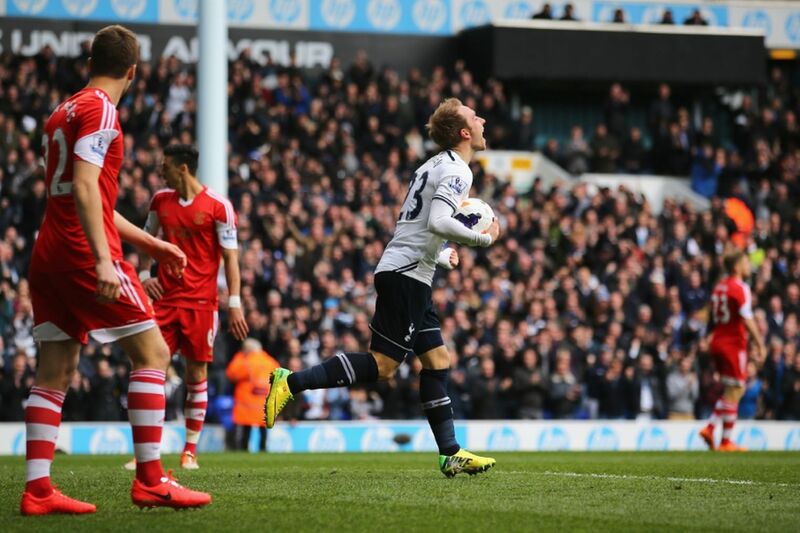 Roberto Soldado’s softened pass nearly provided a wonderfully worked team goal; Eriksen was unlucky not to finish. The pair combined beautifully throughout the match. Soldado never really looked like scoring, but his hold-up play was nothing short of sublime. The Spaniard is at his best when the ball is played into his feet. His first touch is exquisite. It will be interesting to see if Sherwood continues with the Eriksen-Soldado dynamic at Anfield next weekend. This is likely to depend on the fitness of Emmanuel Adebayor. Quality players instill confidence in poorly organised sides. At 0-2, Spurs fans were facing up to the possibility of yet another embarrassing league defeat. Luckily, the ability of Eriksen and Soldado shone through. Aaron Lennon was extremely quiet. 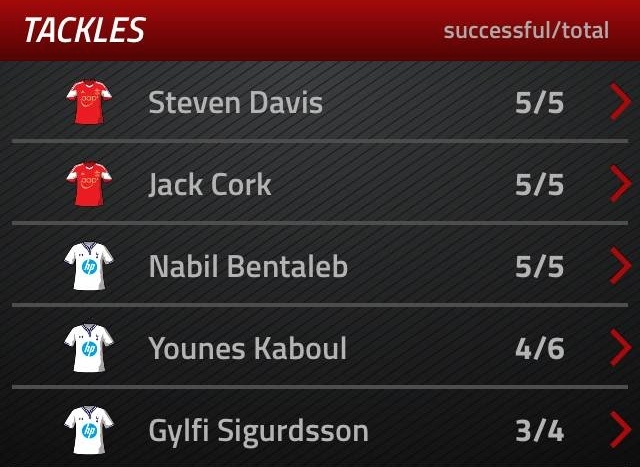 The in-form Nacer Chadli buzzed about, but had no real impact. 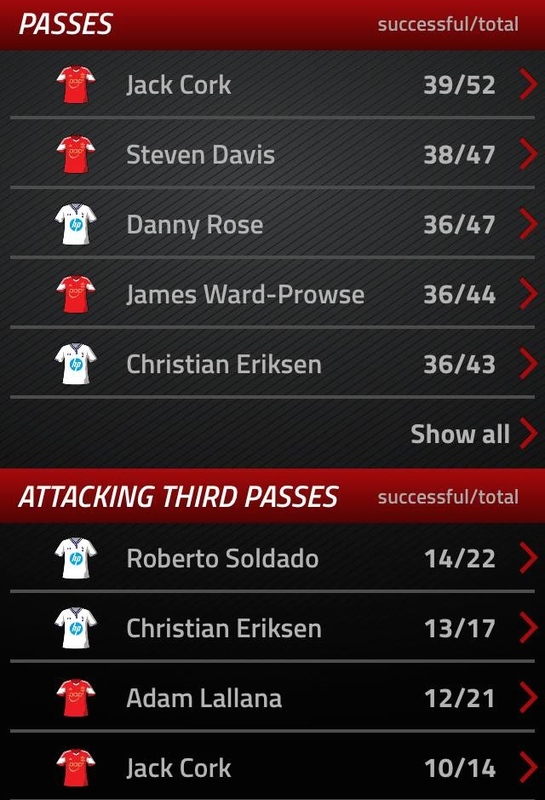 Sigurdsson’s strike won the game, but the Eriksen/Soldado partnership was the creative catalyst. Despite the clear lack of organisation, especially in the opening 45 minutes, the players were quick to praise Sherwood’s half-time influence. Whether he tactically inspired his troops is impossible to know, but whatever he said certainly provoked Spurs to take the game to Southampton. The visitors completely lost their flow in the second half as Tottenham became the dominant force, resulting in a comeback which finally brought a bit of excitement back to the Lane.